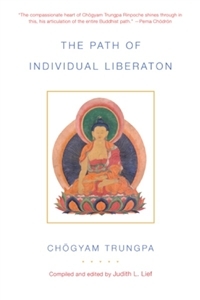 The Path of Individual Liberation, represents the wisdom of the hinayana. It examines the nature of suffering, impermanence, and egolessness, with an emphasis on personal development through meditative discipline and study. The hinayana path is based on training in mindfulness and awareness, cultivating virtue, and cutting grasping. Topics covered in detail in this volume include the four noble truths, karma, the four foundations of mindfulness, meditation practice, the refuge vows, the three jewels, the five skandhas, the five precepts, twofold egolessness, and more.